Do you recognise this building with its decorative carved columns? 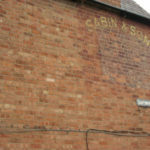 It’s one known to generations of Leamingtonians as Sabin’s, – the Leamington bread shop and bakery in years gone by. 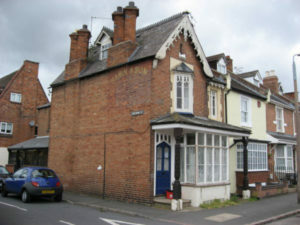 Mona Radford, nee Sabin, was born at the shop in Farley Street, into a family business started by her great grandfather Joseph, who seems to have been first a Porter, then a successful baker and confectioner, a business continued by his son Charles and grandson Victor Charles, and now (in a new location) by Mona’s nephew. 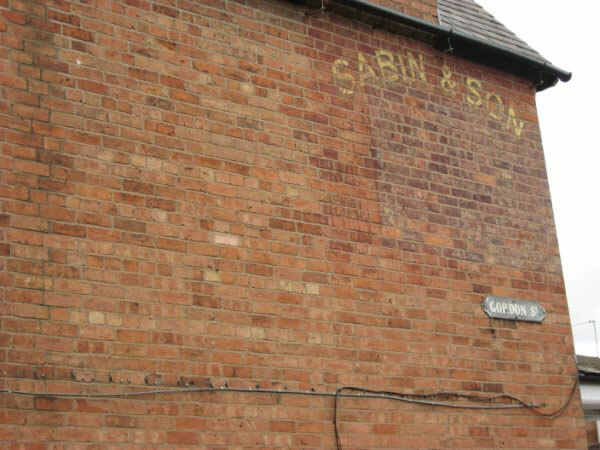 Although number 14 Farley Street is now a house, the shop sign can still be seen painted high up on the brick wall fronting Gordon Street. Each generation of the family lived at the shop, with the bakery at the back. Victor’s family of four children, Mona Evelyn, John Victor, Charles Owen and Angela all grew up there. Mona enjoyed school and went at the age of eleven to the Girls’ Grammar School over the old Library in Avenue Road. She has fond memories of the art room in particular. The bakery flourished, and when Mona was 15, she had to leave school to help with the family at home and in the shop – not an uncommon thing for the oldest girl in a family, even in the early 1930s. She remembers her father having to pay the school a fee for her to be allowed to leave before the due date. She worked in the family business until she married at the end of the second world war.